In order to help celebrate the legendary career of Germany’s Mister Eishockey, XAVER UNSINN, the blog is busy organzing a movement to effectively and thoroughly Occupy the 1976 Winter Olympic Games in Innsbruck, Austria. Some groundwork has been previously posted here at this blog already, including detailed works on the dramatic GOLD MEDAL MATCH from the historic Olympiaeishalle featuring the mighty Eastern bloc rivals of CZECHOSLOVAKIA and the SOVIET UNION. The memorable ice hockey tournament in the Austrian Alps also included a boycott from both Canada and Sweden in response to the continued ban against “professional” players, a failed drugs test by the team captain of Czechoslovakia as well as a three-team photo finish between Finland, the United States and West Germany for the 1976 Olympic bronze medal. As always, no passports are required and all are invited en masse to share in the magical moments of international ice hockey history which are joyfully replayed continuously here. WEST GERMANY national team captain ALOIS SCHLODER of EV Landshut ascends to the top of the podium at the Olympiahalle to accept the bronze medal for ice hockey from I.O.C. 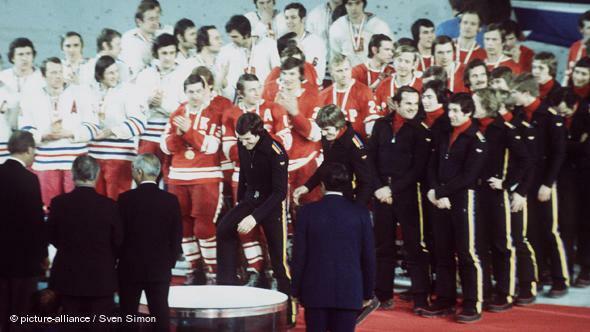 officials during the 1976 Wiinter Olympic Games in Innsbruck, Austria; the silver medalists from CZECHOSLOVAKIA (white sweaters, left) and the gold medal squad from the SOVIET UNION (red sweaters, center), led by captain BORIS MIKHAILOV (K, # 13) of CSKA Moscow, applaud having already received their respective rewards. 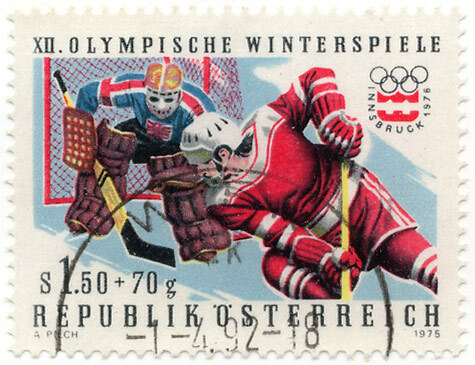 While the U.S.S.R. won the gold medal at the 1976 Winter Games in Innsbruck for a record-tying fourth consecutive time, the set of bronze medals earned by the Bundesrepublik Deutschland in the Austrian Alps marked the first time in 44 years and only the second occasion, ever, that a German ice hockey squad had finished inside the top three at the prestigous Olympic tournament. The proceedings in the Austrian Alps also played host to the so-called Elimination Game for the last time ever at an Olympic event. These once and done qualification matches, initially implemented by the I.O.C. at the Innsbruck Games of 1964, were meant to give countries that traditionally competed in the lower B Pool at the IIHF World Championships the opportunity to pull off a big upset and reach the final round at the Winter Games. What often (and predictably) resulted were lopsided blowouts. Such as the 14-1 beating Czechoslovakia issued to Bulgaria at the Olympiahalle on February 2, 1976, or the 16-3 thrashing that the Soviet Union inflicted upon host nation Austria the very next day in Innsbruck … but that would be another Olympic story. 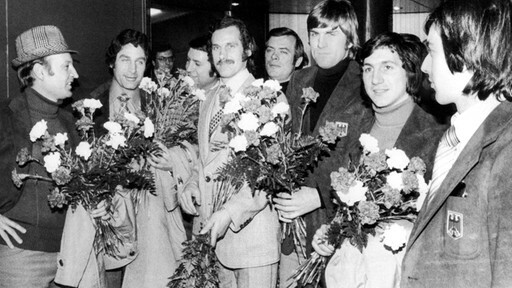 West Germany’s flower-bearing Olympic bronze medal trainer XAVER UNSINN (left) and five of his 1976 Bundesliga champion squad SC Berlin — forwards ERNST KOEPF, FERENC VOZAR, LORENZ FUNK, MARTIN HINTERSTOCKER and goaltender ERICH WEISHAUPT — return triumphantly from the 1976 Winter Olympic Games hosted by Innsbruck in neighboring Austria.